Here is what FAFSA.com looked like before the URL was handed over to the Dept. of Education. Five years ago, we told readers looking to fill out the Free Application for Federal Student Aid (FAFSA) to steer clear of FAFSA.com, as it was not the official Dept. of Education site for the FAFSA. Today, federal regulators announced a $5.2 million settlement with the company behind the now-defunct website for illegal billing practices. According to the complaint [PDF] filed by the Consumer Financial Protection Bureau with a federal court in California, until earlier this month a company called Student Financial Aid Services, Inc., was operating FAFSA.com, and offering FAFSA preparation services online or over the telephone, for a fee. The site offered three different premium plans, all of which were set up as “negative option” renewal subscription plans. That means that unless the subscriber specifically told the company to halt the subscription, or unless the company decided to end the recurring charges, the user’s account would be charged each year for FAFSA prep help even if no help was requested. The problem with the FAFSA.com model wasn’t necessarily the automatic renewals, but the deceptive ways in which the site got users to enroll. The CFPB alleges that users were told these premium plans were available at “no additional cost,” when in fact there were annual fees of $67 to $85, which were charged automatically to the consumer’s card or bank account on file for up to four years. And subsequent post-purchase confirmation e-mails from the site did not indicate that there would be recurring charges for service, whether it was requested or not. It wasn’t just the website that was misleading, the company’s phone sales operation also glossed over the nature of the recurring charges. In all, between 2011 and 2013, the CFPB alleges that SFAS processed approximately 206,000 automatic charges against the accounts of consumers who did not file a FAFSA through the company during that application year. Per a consent order [PDF] with the CFPB, the company must pay $5.2 million that will be used to repay those who were charged for unauthorized, recurring service fees. 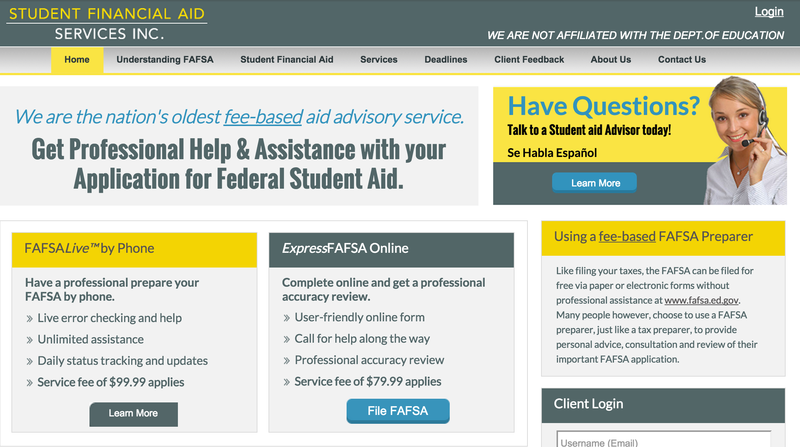 FAFSA.com no longer sells SFAS services. Instead, it offers visitors a portal to either the Dept. of Education website or a login for existing FAFSA.com customers to access their accounts.